You are working with a team of preventive cardiologists investigating whether elevated serum homocysteine levels are linked to atherosclerosis (plaque buildup) in coronary arteries. The planned analysis is an ordinary least squares regression to assess the relationship between total homocysteine level (tHcy) and a plaque burden index (PBI), adjusting for six other variables: age, gender, plasma levels of folate, vitamin , vitamin , and a serum cholesterol index. You will regress PBI on tHcy and the six other predictors (plus the intercept) and use a Type III test to assess whether tHcy is a significant predictor after adjusting for the others. You wonder whether 100 subjects will provide adequate statistical power. This is a correlational study at a single time. Subjects will be screened so that about half will have had a heart problem. All eight variables will be measured during one visit. Most clinicians are familiar with simple correlations between two variables, so you decide to pose the statistical problem in terms of estimating and testing the partial correlation between = tHcy and = PBI, controlling for the six other predictor variables ( ). This greatly simplifies matters, especially the elicitation of the conjectured effect. 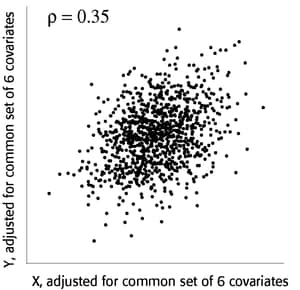 You use partial regression plots like that shown in Figure 68.9 to teach the team that the partial correlation between PBI and tHcy is the correlation of two sets of residuals obtained from ordinary regression models, one from regressing PBI on the six covariates and the other from regressing tHcy on the same covariates. Thus each subject has "expected" tHcy and PBI values based on the six covariates. The cardiologists believe that subjects whose tHcy is relatively higher than expected will also have a PBI that is relatively higher than expected. The partial correlation quantifies that adjusted association just as a standard simple correlation does with the unadjusted linear association between two variables. Based on previously published studies of various coronary risk factors and after viewing a set of scatterplots showing various correlations, the team surmises that the true partial correlation is likely to be at least 0.35. The POWER=. option identifies power as the parameter to compute. The NFULLPREDICTORS= option specifies seven total predictors (not including the intercept), and the NTESTPREDICTORS= option indicates that one of those predictors is being tested. The PARTIALCORR= and NTOTAL= options specify the partial correlation and sample size, respectively. The default value for the ALPHA= option sets the significance level to 0.05. The X=N option in the plot statement requests a plot of sample size on the X axis, and the MIN= and MAX= options specify the sample size range. Output 68.5.1 shows the output, and Output 68.5.2 shows the plot. For the sample size = 100, the study is almost balanced with respect to Type I and Type II error rates, with = 0.05 and = 1 – 0.937 = 0.063. The study thus seems well designed at this sample size. The DIST=FISHERZ option in the ONECORR statement specifies Fisher’s test. The NPARTIALVARS= option specifies that six additional variables are adjusted for in the partial correlation. The CORR= option specifies the conjectured correlation of 0.35, and the NULLCORR= option indicates the null value of 0.2. The SIDES= option specifies a one-sided test. Output 68.5.3 shows the output. The NTOTAL=. option identifies sample size as the parameter to compute, and the POWER= option specifies the target powers. 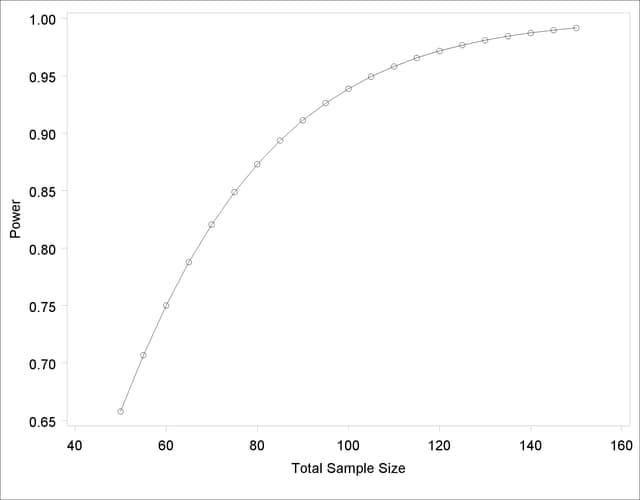 The results in Output 68.5.4 reveal a required sample size of 417 to achieve a power of 0.95 and a required sample size of 280 to achieve a power of 0.85.